Quality case bound cover. 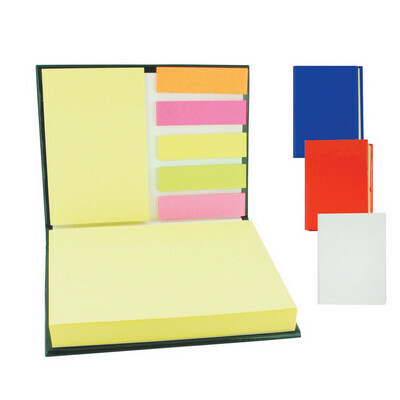 Large and small size stick note pads. 5 multi coloured sticky tabs. Product Size: 105 x 80 x 20mm. Product Packing: Bulk packed. Decoration Size: 70 x 40mm. Decoration Position: Front cover. Decoration Method: Pad Print. Carton Quantities: 100. Carton Size: 45 x 24 x 21. Carton Weight: 13. Colour: Black | Blue | Red | White. Price includes: See drop down menu for decoration options.